A new printing of the 1st class Scotland and 2nd class England country definitives was made on 19 May 2016. As with the 2nd class Scotland the silver cylinder for the Queen's head and (in the case of the Scotland stamp) value has been dropped, and these details now appear in grey. Unlike the 2nd class Scotland, which was printed in all four panes on the sheets, the four panes on the latest printing are shared, with the Scotland 1st being in the left column, and the England 2nd being in the right column, ie two panes each on a master sheet. The cylinder numbers are once again C1, phosphor, yellow, magenta, cyan and black, reading downwards. 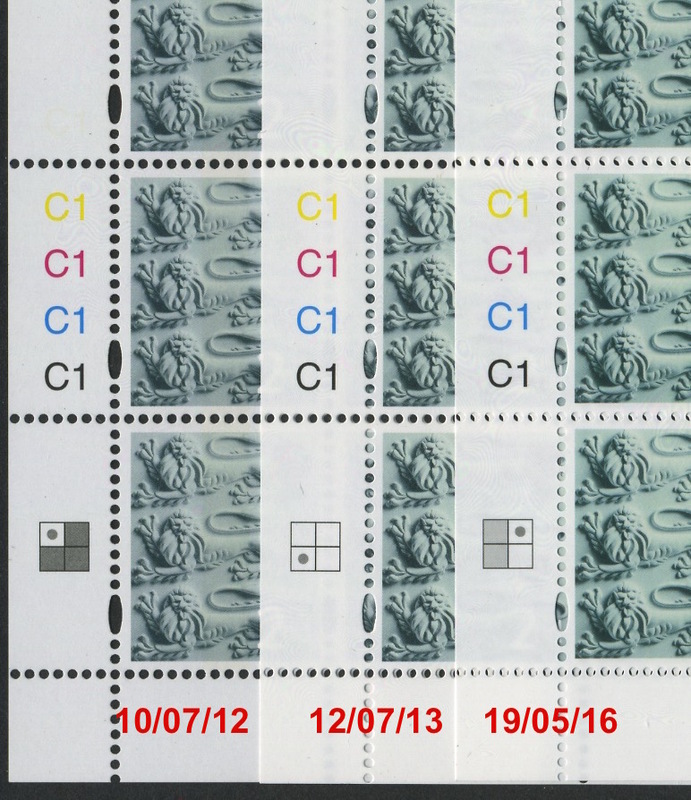 The single phosphor band on the 2nd class stamp is easy to see, but the 2 bands on the 1st class stamp are more difficult to see in normal light. I was surprised to find, on checking my reference collection, that the change from silver to grey on the 2nd class England stamp appears to have taken place at least four years ago, when Cartor took over the production of these. I have a block with a printing date of 10/07/12 and another 12/07/13, with a different master sheet configuration. And the latest one is yet another new configuration. This picture shows the cylinder numbers for the three printings I have with a grey head. As you can see, the first printing (10/07/12, released by Tallents House on 3 January 2013) has the England 2nd class in just one of the 4 positions on the master sheet. The second printing (12/07/13) has the same stamp in all 4 positions - either more were needed or the print run was shorter. This was available from Tallents House from approximately September 2013 to January 2014. The latest printing (19/05/16) has just two positions for the same stamp. These are obviously all new cylinders but ISP/Cartor for some reason see no need to increment the numbers - and Royal Mail apparently see no reason to suggest that they should do so! As far as I know there have not been any Cartor printings of this stamp other than those shown. The second picture shows both stamps from the current printing. 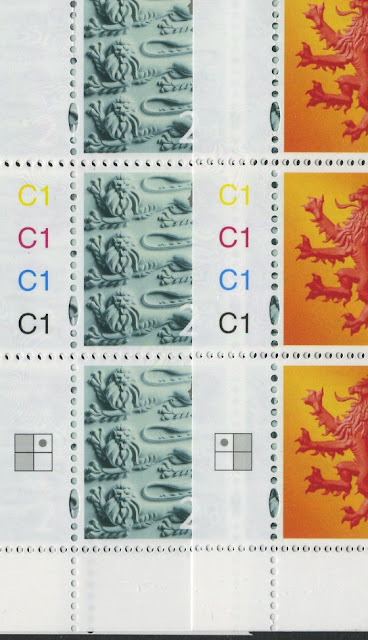 The stamps, including date and cylinder blocks, will be added to our webshop for purchase in November when we re-open. I checked my collection and believe that the Scottish 1st class from the Queen's 90th Birthday prestige book definitive pane has a grey head?